Degenerative joint disease (DJD) is a type of osteoarthritis that causes lameness in affected horses and is one of the most common causes of lameness in sport horses. DJD develops when the cartilage protecting the bones of the joint is destroyed. 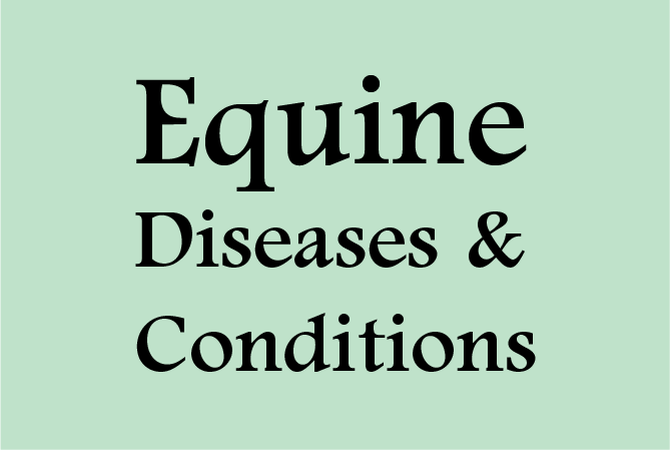 Lameness varies depending on the stage of the disease. There may be varying degrees of excess fluid in the joint, an abnormal thickening and scarring of the membranes, and restricted motion of the involved joints. X-rays show decreased joint space, bony outgrowths, inflammation of the muscles or tendons, and a hardening and thickening of the tissue below the cartilage. Degenerative joint disease, is a progressive deterioration of the joint cartilage and represents the end stage of several other diseases including traumatic arthritis involving the synovial membrane and joint capsule, joint fractures, traumatic damage to cartilage, osteochondritis dissecans, cysts beneath cartilage, and infective arthritis. Cartilage, which is made up of collagen fibers, glycosaminoglycans, and proteoglycans, is associated in direct proportion with the severity of the disease. When the articular cartilage loses its elasticity and ability to bear and transmit forces efficiently, it creates a cascading cycle of more cartilage damage, and the complex process results in the net loss of cartilage. The joints that are usually affected are the lower joints of the legs because they are the major shock absorbers. In addition to loss of cartilage, degenerative joint disease often leads to the growth of bone in the affected limbs. In the forelimb, it is usually the carpus (knee). In the hind limb, it is commonly the hock, also know as bone spavin. In the coffin joint, it is called low ring bone and, in the pastern, it is known as high ring bone. Because of the bone growth, horses will show signs of lameness and pain with flexion of the involved joints. Swelling occurs in the affected joint; and, if the process has been ongoing, decreased range of flexion occurs. The joints most commonly affected are the upper knee joint, front fetlocks, hocks, coffin joints in the forefeet, and the spine, including the neck and back. The form of degenerative joint disease known as osteochondritis dissecans occurs when the immature joint cartilage separates from the underlying bone. Fluid enters the space, and cysts may form under the cartilage. The cartilage may break away completely or, if the joint is rested or protected, reattach itself to bone. Two major factors control the development and progression of DJD: biomechanical forces and biochemical substances. The biomechanical forces are the excessive forces that the horse puts on its joints through repetitive stress and strain during exercise. The biochemical damage occurs when enzymes are released into the joint, resulting in the breakdown of the joint cartilage. This leads to more enzymes being released, causing further cartilage damage resulting in a self-perpetuating destructive cycle. Cartilage in the joints is made up of cells known as chondroctyes and a matrix of proteins. These cells have a very limited ability to regenerate, resulting in irreversible cartilage destruction. The best way to control DJD is to prevent it. Unfortunately, because this disease is often secondary to a traumatic incident, prevention is difficult. However, several areas of care can help reduce the possibility of developing DJD from an injury. A diet with balanced vitamins and minerals plus the correct ratio of roughage to grain should be formulated to help with the proper development of cartilage. As a foal, the conformation of the limbs will greatly influence the way the joint will wear as the horse matures. When proper alignment is missing, abnormal wear may lead to premature DJD of the joint. Hoof care is an area that is often overlooked but has a lot to do with the proper alignment of the lower pastern region. Adequate trimming and shoeing can help maintain alignment. Finally the training regime must be reasonable for the animal. It is important that the training ground is level and that the surface is not too hard or too soft. Each animal should have a work schedule tailored to its unique fitness level and injury status. Treatment of degenerative joint disease is generally limited to reducing joint pain and stiffness. Nonsteroidal anti-inflammatory drugs (for example, firocoxib, ketoprofen, and phenylbutazone) or corticosteroids may provide relief. Chronic use of many of these agents can decrease or suppress chondrocyte metabolism and cause further degradation of the cartilage matrix by the inhibition of normal collagen and proteoglycans synthesis. Some NSAlDs can cause gastrointestinal ulceration and hemorrhage. The problems and limitations of NSAlDs and steroidal anti-inflammatory agents have recently led to a search for agents that relieve pain and inflammation and limit or reverse cartilage degeneration side effects. In all cases involving degenerative joint disease, the services of a knowledgeable veterinarian are invaluable. With proper treatment accompanied by an appropriate work load and exercise based on the particular horse's capacity, the effects of degenerative joint disease can be minimized.